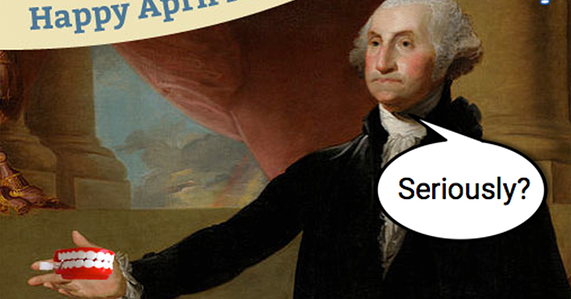 April Fools' Day has a long, storied history. Archeologists recently discovered a cave painting in western Asia depicting a caveman dressed in the skin of a saber-toothed tiger sneaking up on another to scare him for laughs. Dating back to 38,000 BCE, this prank began an annual tradition roughly translated into English as Stupid Tiger Day. The yearly ritual of tricking our friends, neighbors, and younger siblings has thrived for millennia since. And in recent years, it has taught us a valuable lesson: you shouldn't trust a single thing you read on the internet. So, before you start planning your pranks for Monday, let's look back at some famous tricks, gags, and general April Foolery throughout history. Martha Washington lightens the grim Revolutionary War mood by replacing George's teeth with wind-up chattering chompers. He is not amused. Jane Austen glitterbombs the Brontë Sisters. Like all young goths, they dryly respond, "She's still alive?" Louisa May Alcott shakes up Mark Twain's bottle of sarsaparilla, which promptly sprays him in the face. His mustache is sticky for days. Ezra Pound finds the fork in the woods that inspired Frost's famous poem and carves another path through the trees. During his next hike, Frost discovers there are now three paths from which to choose. He is forced to rethink his entire poetic philosophy. Katherine Mansfield sneaks into Virginia Woolf's room of her own and balances a pail of water carefully over the door. Drenched, the wet Woolf chases Mansfield all the way to the lighthouse. J.D. Salinger, notorious recluse, pees on a paper plate, freezes it, and slides the frozen disc of urine under the door of another notorious recluse, Howard Hughes...where it melts into a puddle on his carpet. After Hughes steps in it, his hypochondria worsens and he starts to wear diapers around the house. The scene was filmed for the Hughes biopic, The Aviator, but was cut—and the footage was lost forever. Martin Luther King, Jr. fills Rosa Parks' lotion bottle with mayonnaise. She later retaliates by spraying him in the face with a squirting flower before he delivers a speech. Koko, the sign language gorilla, a scholar of Neanderthal humor, recreates the first known April Fools' Day prank, dressing in tiger skin to scare the elephants who live in the next pen over. They never forget this prank, and are still waiting for the perfect opportunity to get her back. Mr. T celebrates April Fools' Day by quietly announcing, "I commiserate with the ignoramus who does not put the apostrophe in the right place in April Fools' Day." To break the ice on a diplomatic visit to Japan, President George H.W. Bush plans an elaborate prank involving fake vomit. Upon landing in Tokyo, Bush realizes he forgot to pack the rubber barf. Committed to the gag (pun intended), Bush produces the real thing all over the Prime Minister. To this day, April 1 in Japan is known as Bushu-suru, or Bush Day. During a rare year in which Meryl Streep was not nominated for an Oscar, she reveals that Roberto Benigni, that year's Best Actor for Life is Beautiful, was actually Streep disguised as a man. Turns out she had been nominated and won after all. 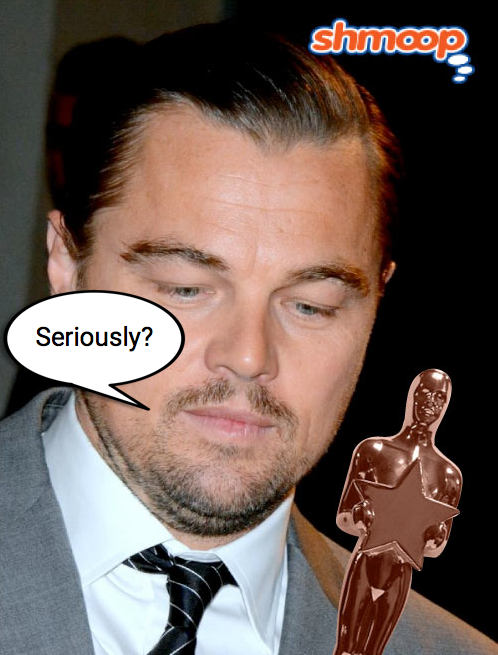 Spoiler alert: Leonardo DiCaprio will learn, via a warm spring season in Los Angeles, that his long-sought-after Oscar was actually made of chocolate. What tricks will you pull on your friends this year? See if you can come up with one that'll go down in history. Just...play nice. Especially the first day, eh? To see more famous quotes, check out our Quotes page.